This improbable, larger-than-life tale of abandonment and redemptive love makes entertaining reading, but I wonder whether the feel-good got in the way–unless, of course, you think it needs no justification. That larger question belongs in a future post, but for now, let’s consider The Tilted World on its own, fairly considerable merits. Start with the premise, which has two federal agents casing Hobnob Landing, a fictional Mississippi town, in spring 1927. The region has suffered biblical rainstorms, and the mighty river has risen, threatening to break the levees and bring disaster. But the two agents, Ham Johnson and Teddy Ingersoll, aren’t there to help tame the tide, though they pitch in heroically. Rather, reporting to Herbert Hoover, ambitious secretary of commerce who wants the Republican nomination in 1928, Ham and Ingersoll are to: investigate the murders of two Prohibition agents; solve the case; and keep the news from a hungry press eager to discredit the government. Nothing to it, right? 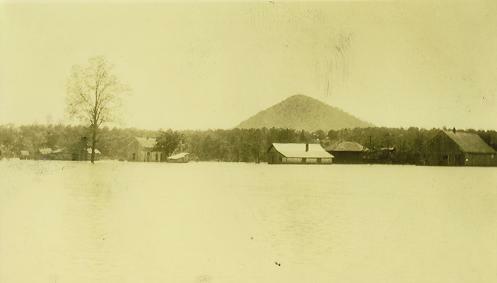 Natural Steps, Arkansas, during the Mississippi flood of 1927 (Courtesy Wikipedia). But no sooner do they arrive in Hobnob Landing than they happen on the bodies from a random, everyday shootout, the only survivor of which is a crying infant. Ingersoll takes the orphan’s care upon himself. He gives the boy to Dixie Clay Hollister, a woman who happens to be mourning her only child. Dixie Clay also happens to be a bootlegger, which the good-hearted Ingersoll doesn’t know. Nor can he guess that her husband, Jesse, walks that Mississippi Valley of death fearing no evil because he’s the meanest sonofabitch in it and the probable killer of the two Prohibition men. Dixie Clay is bereft of love and destined to remain so, she supposes, because she let Jesse’s charm blind her to his now-obvious flaws. Ingersoll, an adept who can shoot straighter than anybody, set a broken limb, and (in a hilarious scene) make a one-string blues guitar from the wire around a broom neck, has never turned his resourcefulness to find time to become emotionally attached. Bootlegger and federal agent, a match made in heaven, and it’s an orphan who brings them together–fittingly so, because Ingersoll grew up in an orphanage. I like the irony in this novel. Dixie Clay makes a quality product to scrupulous standards, for which she demands top dollar; no bathtub gin for her. The joyful love she lavishes on Willy, the infant, feels real and touching, and she generously gives people the benefit of the doubt. A good person, in other words, who made the mistake of marrying a scoundrel. Meanwhile, there’s rampant bribery, whoring, and racism running through Hobnob Landing, none of which anybody objects to. But the law has made Dixie Clay a criminal, and Ingersoll, who sees her need and understands her context, will have to arrest her to fulfill his office. Consequently, the tension in The Tilted World comes mostly from whether evil deeds go unpunished while good ones bring catastrophe, and the authors delay the definitive answer with skill. However, it’s pretty clear from the get-go what’s meant to happen, and various scenes of dire circumstances stray perilously close to cliché, if not going over the line. Call me unromantic, but I think a woman with a freshly broken arm and cracked ribs would tell her lover, “Not tonight, dear.” But maybe we should all inhabit a novel someday. Ingersoll seems altogether too nurturing and sensitive to have never made a friend besides Ham, whereas Dixie Clay is rather erudite for someone who’s had practically no formal learning. Remarkably, neither reveals an ounce of prejudice about anyone. Jesse starts out as a believable villain but slides into over-the-top stereotype. In his single but crucial scene, Herbert C. Hoover sounds more like J. Edgar Hoover (and I doubt that the secretary of commerce would have been chasing the nomination four months before Coolidge renounced it). The flashbacks to World War I, in which Ham and Ingersoll served together, offer much extraneous detail and a few inaccuracies; here, the authors’ love of period detail gets them into trouble. On the plus side, there’s the prose. I loved this passage, in which Dixie Clay frees a hummingbird that has stuck its “needle nose” in a screen door, and whose “wings in their blurry panic” remind her of the outboard motor on Jesse’s boat. Dixie Clay opened her palm, but the hummer didn’t fly away, just sat, stunned, its heartbeat rapid. . . . The hummer’s grommet had three or four scarlet flecks, and so she knew it was a young male, just easing into its ruby muffler, one feather at a time. Like Willy’s eyes, which she’d studied earlier that day, in the process of turning from blue-gray to brown, not by darkening overall but dot by chocolate dot. I’ll show you hummingbirds, Willy. I’ll show you every wondrous thing. There are wondrous things in The Tilted World, along with the excesses. Take all of that for what you will.